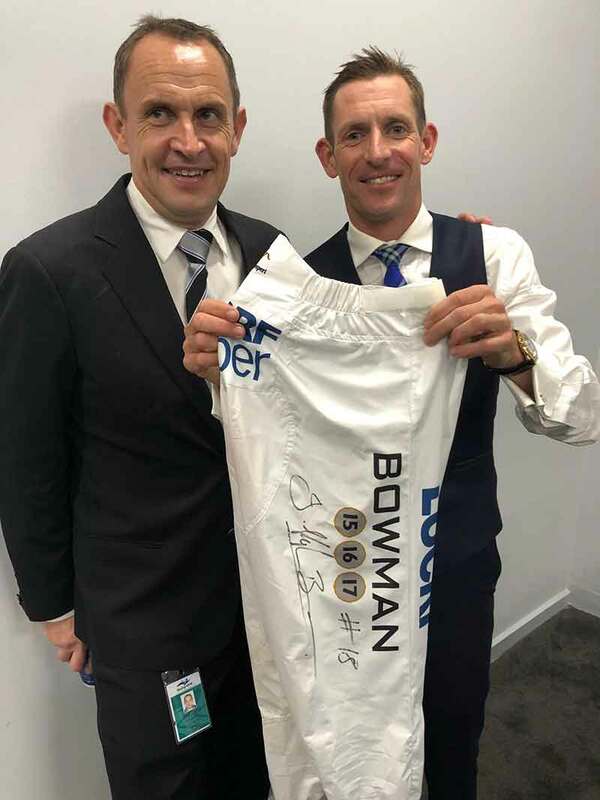 Home>News>Hugh Bowman donates Winx record breaking 4th Cox Plate breeches to support injured jockeys. Hugh Bowman gifted his 2018 Cox Plate winning breeches to the National Jockeys Trust on Saturday after her 29th win a row. The breeches have been signed by Bowman and authenticated by the Australian Jockeys Association. The unique memorabilia will be auctioned at the Call of the Card on Cup Eve, Monday 5th November 2018 at Palladium at Crown, hosted by Jason Richardson and Hamish McLachlan. 100% of the proceeds from this item will be donated to the National Jockeys Trust. “Hugh Bowman is a true champion both in the saddle and in his support of the National Jockeys Trust. These signed breeches are now an incredible piece of Australian racing history. I would like to formally acknowledge Crown Resorts and Call of the Card organisers for the opportunity to maximize their value at their event” said Des O’Keeffe, Chairman, Australian Jockeys Association. Hugh Bowman and Winx continue to create history. In winning the 2018 Cox Plate, Winx surpassed Kingston Town’s previous record of three Cox Plates. She is the Queen of Racing and recognized by many as Australia’s greatest ever racehorse. Winx continues to break records each time she steps onto a racetrack. Winx broke her own track record in her second and third Cox Plate victories and her winning margin in the third Cox Plate of 8 lengths stands as the greatest winning margin ever. Winx holds the Australasian prizemoney record of $22,934,925 has now won 29 races in succession, 33 in total, with 22 at Group 1 level. Hugh Bowman has combined with Winx for 28 of her 33 victories and they will be remembered as one of the greatest combinations in racing history. He is currently leading the 2018 Longines IFHA World Best Jockey rankings, and has won 83 Group 1 wins and four Sydney Metropolitan Jockeys Premierships during an illustrious career. Hugh Bowman will participate in the live auction and the winning bidder (if in attendance at the Call of the Card) will be invited to have their photograph taken with the jockey and the signed breeches. The breeches will be custom framed, with the winning bidder contributing to and approving the final design prior to framing. The auction will be live at the Call of the Card, however, interested parties can register for phone bidding. To register for phone bidding, please contact Tahl Samuel at the National Jockeys Trust on 0402 445 517. Phone Bidding registration closes at 10am AEDT Monday 5th November 2018. The National Jockeys Trust (NJT) provides support for former and current jockeys, and their families who are in necessitous circumstances as a result of serious injury, illness or death of a jockey. NJT has provided over 350 jockeys with $3.5 million in support. Each year 40% of jockeys have a fall that prevent them from riding for an average of 5 weeks, with 5% of these falls deemed career ending. In excess of 880 Australian jockeys have lost their lives as a result of race falls. The Call of the Card is held each year in the Palladium at Crown on Melbourne Cup Eve. The event includes live entertainment, a three-course lunch and the official "Call of the Card" where Melbourne's biggest betting bookmakers take the first official bets for the race that stops a nation. You can purchase tickets to the event by visiting Ticketmaster.